But on one of DStv's most exclusive channels instead of SABC1. 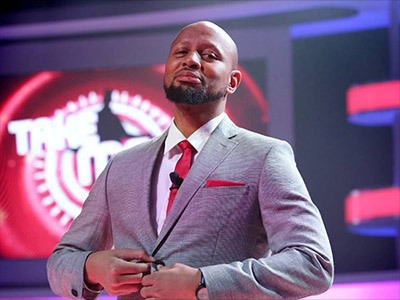 Vuzu Amp has seized the dating reality show Take Me Out from SABC1 and they've gone full trottle by recreating it with Phat Joe, who hosted the SABC1 series when it aired in 2014. They've subtitled the show Take Me Out Mzansi instead of Take Me Out South Africa and they've introduced a change to the international format. The series usually features a single guy who tries to impress a panel of 30 single girls who are armed with white lights which they can turn off if they're unimpressed with him. In Vuzu Amp's version, both guys and girls will be in the firing line so episodes will feature line-ups of 30 girls or guys. It premieres on Monday, 10 July at 19h00. For more about the format, take a look at TVSA's Take Me Out Show Page. Newsflash: We've just chatted to Real Goboza producers Urban Brew to find out if Joe's leaving RGB for Take Me Out and they say he isn't. They say he's taken time off to film Take Me Out but he hasn't left RGB and will be back. That's why he's not #ECRDrive radio show the past 3weeks.